The Schumacher brand is the flagship of F. Schumacher & Co., representing the height of design sophistication and elegance in fine decorative fabrics, wallpaper, furnishings, decorative accessories and carpets. The Schumacher brand sets the standard for classic styling and superior quality, which have been the hallmarks of the company since its founding in 1889 by Frederic Schumacher. The Schumacher brand is sold exclusively through interior designers, who have access to an extensive network of trade showrooms throughout North America. 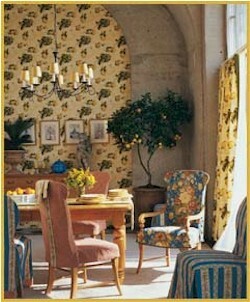 The Schumacher label is featured solely on the finest printed and woven decorative fabrics, trimmings, casements and sheers, wallpaper, fine furniture, decorative accent pieces and carpets. Schumacher is widely recognized for its authentic historical reproduction pieces, many based on documents from the company’s extraordinary archives. These matchless archives contain original source material and an extensive selection of designs from the 17th, 18th and 19th century, many of them commissioned by European royalty. Schumacher also is known for its original designs, created by some of the most talented and imaginative professionals in the industry today. Schumacher’s graceful designs and products are often featured in prestigious designer showhouses around the country, as well as spotlighted in leading interior design and home furnishings publications. Schumacher products also are distributed throughout Europe, Asia and South America.